Be inspired by our vast collection of images and getting pinning for your next project. Transforming your home & garden can be a lengthy process at times; it requires patience and research to ensure the end goal is delivered. It can be hard to gather inspiration just off the back of catalogues and articles and collating ideas onto a mood board is a nuisance that can be avoided. Pintrest is a trending platform that many users are going to for help with generating ideas for future projects. This social site is used by people and businesses to share images of their products or completed developments and allows users to pin (share) these images to their own boards to create their own digital mood board. This is a hassle free system that is simple to use and anyone can get started with no fees or subscriptions. In the past we did not look to Pintrest as one of our primary platforms, over the years we had seen an increased level of engagement and even gained new clients off the back of it, with not costs involved in using the platform it soon became an obvious choice to change our focus. Users were saving our pins to their boards for ideas, and with some projects taking time to plan we knew we had left a lasting impression with just one pin and a chance of it leading the user to our innovative products. 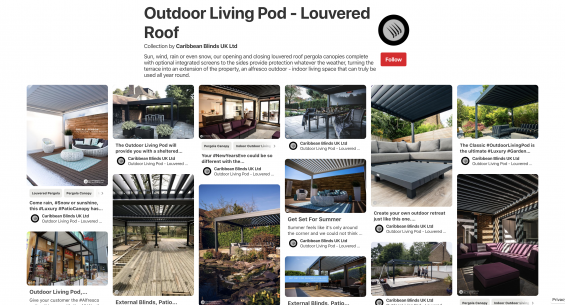 Pintrest has become our platform of choice to highlight our superior shading solutions and give potential clients access to our catalouge of images to help inspire them. What takes 2 minutes to post per day could possibly lead to transforming another home or garden with one of our External Shading Systems. If you are unsure of what you are looking for then visit our Pintrest profile today and be inspired by our endless supply of professional and installation images and get your digital mood board started so you can get a good idea of what you want and need for your project. If you would like more advice on any of our External Blinds, Awnings or Louvered Roofs then contact our team today on 0344 800 1947 or alternatively you can use our quick enquiry form to receive a free product brochure.